On our visits to Oregon when I was a child we would visit my great grandmother Elizabeth and also Verdie (Great Uncle Hobe), and George (and Great Aunt Vera) who lived nearby. My Great Aunt Verdie was such a small woman that once when I must have been 10 or 11 we loaded everyone into my parents station wagon for an afternoon outing, all the kids were in the back of the wagon and my Great Aunt decided to join us there. She climbed over the seat and into the back, even though she was wearing a dress...we couldn't have been more delighted. Trips to Great Uncle George and Great Aunt Vera meant loading buckets with lots of berries and eating lots of berry pies! I have many fond memories of our trips to Portland! 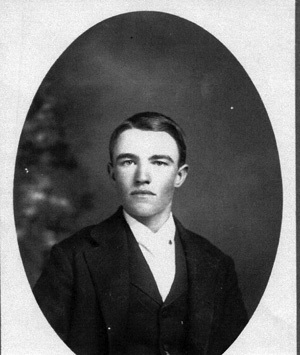 Photograph of Alexander Traudt taken about 1900 just after his arrival in the USA at the age of 18 or 19. 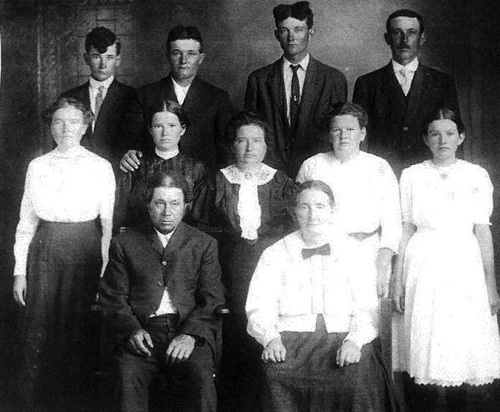 Photograph of the Nikolaus and Anna Marie Sauer Family. 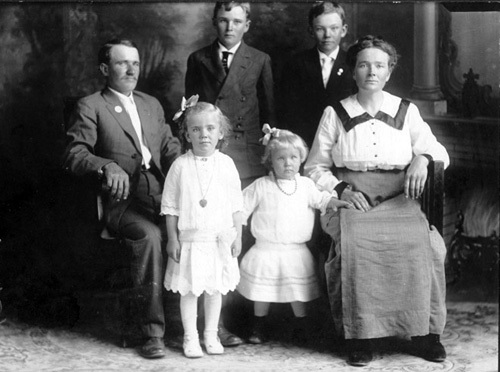 The children standing in the front row from left to right are: Elizabeth, Katie, Lena, Marie and Emelia. The back row left to right are: Conrad, John, Adam and George. The family photo above is of Alexander and Elizabeth (Sauer) Traudt and their children Verdie, Sophie, George and Reinholt (my grandfather). 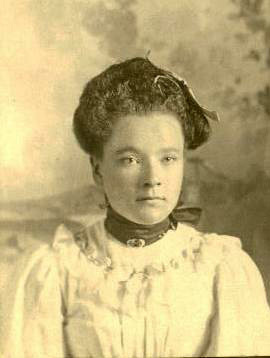 ​The photo below of Elizabeth Sauer Traudt was taken on her wedding day August 2, 1903 in Weatherford, Oklahoma she was just 15 years old. Because she married so young I was lucky enough to actually know my great grandmother, we used to visit her in Portland, Oregon during summer vacations. I always remember eating supper in her dining room where the table would be heaped with all sorts of food, she baked rye bread everyday, and at the end of a big meal there were always cookies or some sort of sweet. When I was a young girl we used to write letters to each other, I always felt very special that my great grandmother took the time to write to me, her oldest great grandchild. She died when I was 16 and I consider myself so fortunate to remember so many things about her. Elizabeth Sauer on her wedding day.